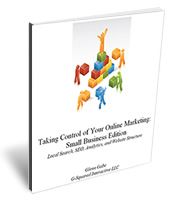 I’m proud to announce the release of my new ebook titled Taking Control of Your Online Marketing: Small Business Edition. The online marketing ebook is a 98 page tactical guide for small to medium sized businesses and covers Local Search, SEO, Web Analytics, Website Structure, and The Long Tail of SEO. I wrote the book in priority order, so each lesson builds upon previous lessons. You’ll find that the book provides a hands-on, take-action approach. I wanted readers to be able to complete each chapter, implement important changes, and then move on to the next lesson. If you’re a small business just starting out, or one that’s not seeing results from your current online marketing efforts, then this book is perfect for you. Businesses (both large and small) needed a solid foundation in online marketing in order to succeed. Without that solid foundation in place, companies had a much harder time gaining traction, acquiring new customers, and increasing sales. My goal was to make sure readers could build a solid online marketing foundation that they can build upon in the future. I always want my clients and readers to get up and running quickly. The book is structured so that’s possible. I’ve come across so many small businesses that are handcuffed when it comes to adding, editing, and optimizing content on their websites. In today’s digital marketing environment, if you cannot easily add new content and tailor your site optimization, then you’re dead in the water. In the book, I explain the technology and process you can utilize to get your site in order. If you’re a local business, then it’s critically important to make sure you have a shot at ranking for searches that are deemed local in nature by the search engines. I’ll show you what to do and where to make changes to achieve strong results. It’s critically important to track your online marketing efforts at a granular level. I provide instructions for setting up Google Analytics, as well as how to track conversion properly on your site. Unfortunately, without a smart analytics strategy in place, you’ll be flying blind. And flying blind is a dangerous thing to do in online marketing. Organic Search is one of the most powerful online marketing channels and should not be ignored. The book covers what you need to do in order optimize your site and content for organic search. SEO is a massive topic and I cover numerous aspects of organic search within the chapter. When I first start helping new clients with SEO, they often approach me about ranking for a handful of competitive keywords. That’s fine, but in reality, they should be targeting the thousands of keywords that stem off of those initial keywords. In the book, I cover the long tail in detail, including what it is, how powerful it can be for your business, and how to effectively target the tail.